Local transit advocates were thrilled when the Jacksonville Transportation Authority (JTA) embarked on a mission to finally upgrade Downtown's long-suffering Skyway. 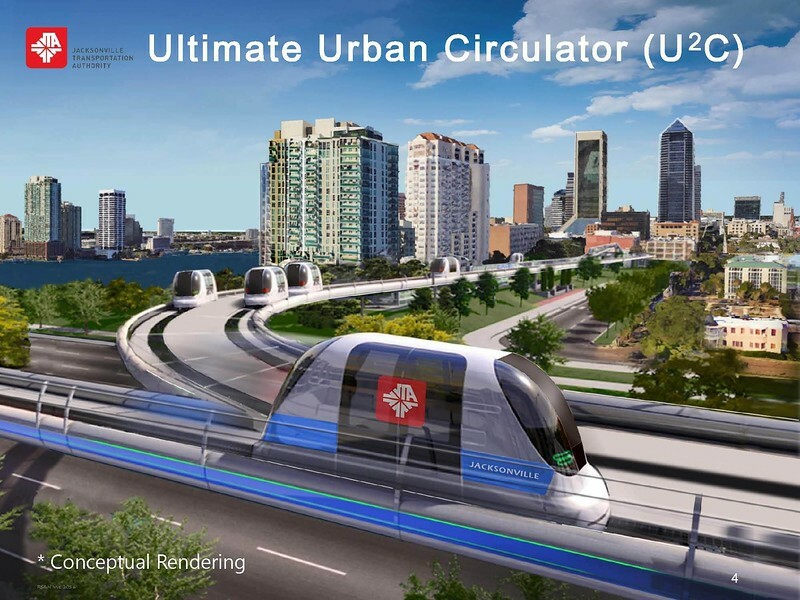 But anticipation for what is being called the Ultimate Urban Circulator, or 'U2C', is quickly melting as questions arise about its ability to adequately serve Urban Core neighborhoods. Is Jacksonville setting itself up for another big transit disappointment? The “U2C” plan came from discussions on what to do with the aging Skyway, considering the system’s main flaws: the Skyway vehicles aren’t manufactured anymore, the elevated structures are too expensive to extend, and they aren’t capable of bearing the weight of light rail or modern streetcars. And so, JTA proposes replacing the Skyway’s monorail trains with autonomous vehicles - essentially small, driverless buses. JTA’s plans call for driverless vehicles that would travel the ramps and also run out into the city streets to provide access to adjacent neighborhoods. It’s a bold idea, but one with red flags that need to be seriously considered and vetted locally before Jacksonville gets roped into another boondoggle. Promotions present JTA at the vanguard of the driverless transit revolution, making much of the fact that JTA has been testing small driverless vehicles on a closed, 1/8 mile track off Bay Street. 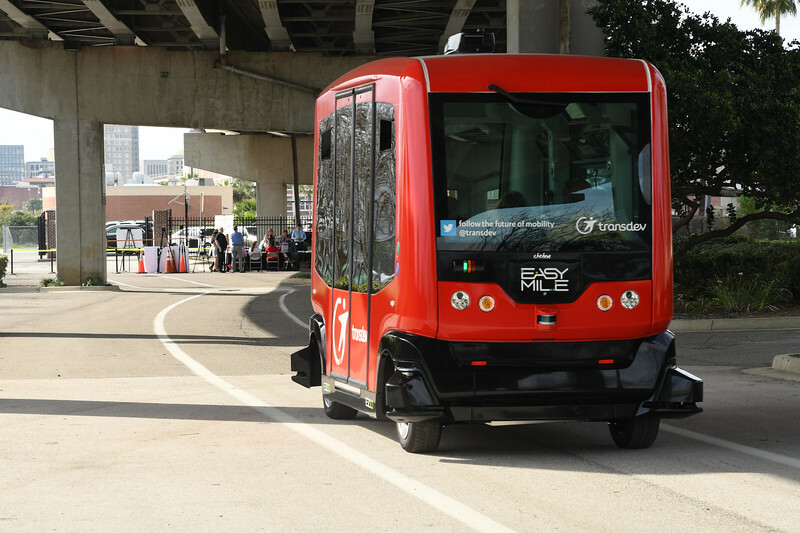 However, a deeper look shows that JTA’s running behind schedule when it comes to testing autonomous transit: more than fifty cities across the globe already conduct autonomous tests, most of which involve running vehicles in traffic, not a closed track. Cities in Michigan, Arizona, and California have huge testing grounds where companies like Google, Apple, Uber, Ford, GM, and others try out vehicles and related technology. Even Florida will have its own autonomous vehicle testing center operational soon. Cites such asAtlanta, Las Vegas, and Ann Arbor already mix their shuttle demonstrations in traffic on actual streets. If Domino’s has been delivering pizzas in autonomous vehicles to the front doors of Miami households, what exactly is being learned here locally along Bay Street? JTA simply does not employ the engineers nor software programmers sufficient to gain meaningful data from the limited demonstrations being conducted in Jacksonville. Jacksonville needs a transit system that knows and meets our transit needs. Here are six areas of serious concern that the JTA and Jacksonville should evaluate before we get too far down the road on the “U2C”. An early rendering illustrating an extended system with elevated dedicated right-of-way. Let’s get this one out of the way first: the “Ultimate Urban Circulator” and “U2C” names are, well, bad. “U2C” isn’t even an acronym for “Ultimate Urban Circulator”, let alone something that an actual human rider would use naturally. Say it out loud: it sounds less like a transit system than a go-go dance the 1960s incarnation of Batman would do. Good transit system names are simple, easy to remember and roll off the tongue: Boston’s “T”, Chicago’s “L”, Atlanta’s MARTA, DC’s Metro… or Jacksonville’s Skyway. There is no reason to replace the Skyway name, which is well established, recognizable, and well known among the people who use the system. The name change is emblematic of the problems with the U2C plan in general: it’s at best a pointless change, and quite possibly a step down from what we’ve got already. Vehicles currently being tested locally, such as the EZ10, can only carry 12 people at maximum capacity, and aren’t compliant with U.S. disability access laws. Currently, it’s hard to get excited about what’s taking place at JTA’s test track since the vehicles being tested aren’t durable enough to be used in public transportation, aren’t compliant with U.S. disability access laws, and have less capacity to serve the downtown core than the Skyway currently does. The JTA Skyway has a maximum line capacity of 3,600 persons per hour per lane direction (pphpd) without the need to replace system components. And this isn’t ideal - it’s well understood that the current Skyway would not have optimal capacity to facilitate major sports events at TIAA Bank Stadium. The vehicles JTA has been testing are far below even that - they hold only 12 people each. That’s not a typo - 12 people. 2getthere’s 3rd generation GRT vehicle carries up to 24 passengers at a maximum cruising speed of 37 mph. It has a typical capacity 4,608 pphpd and a theoretical capacity of 8,640 pphpd. The first system using this vehicle is under construction in Dubai. It will serve as a circulator connection between the Dubai Metro and the Bluewaters Island waterfront project. Meanwhile, autonomous vehicle manufacturer 2getthere is constructing a 1.6-mile, two-station APM system in Dubai featuring its 24-passenger Group Rapid Transit vehicles. These have a capacity of 3,750 pphpd, with the possibility to increase the capacity to 5,000 pphpd. According to 2getthere, a system operating with its own dedicated, elevated track has the potential of ensuring a high capacity between 3,000 to 8,000 pphpd. That number dips to 1,500 to 5,000 pphpd for a segment operating on street level, at-grade dedicated right-of-way. Mix these vehicles in with regular motorized traffic, as shown in the U2C rendering below, and the maximum capacity drops to 500 to 2,500 pphpd. At a minimum, a replacement system should facilitate a higher maximum line capacity than the current Skyway. As mentioned in a recent article by Bloomberg, vehicles that can fit more than 12 passengers will be needed if we seriously want a circulator system that begins to make sense.